Halloween is creeping up around the corner, so what better time than to indulge in a spooktacular read?! 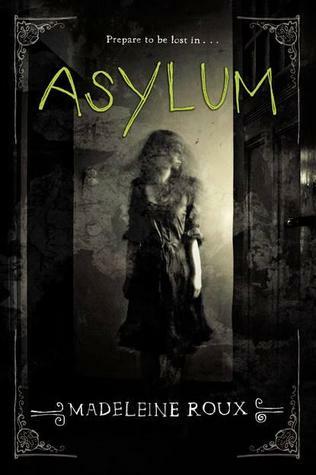 Asylum was the perfect introduction to that indulgence! Said to appeal to fans of Miss Peregrines Home for Peculiar children, I was a little apprehensive; I absolutely adored that novel and I didn't think there would be many books that could compare to it. Well, Miss Peregrines Home for Peculiar Children has met it's match! Both ranking high on the super-creep- factor scale! If you like to be spooked, than this is the perfect book for you! Full of haunting photographs that will sneak there way into your dreams(especially if you read this book in bed!). Asylum packed a lot of punch! This book is more storyline directed than it is character driven. Sure, you connect with the characters most of the time, but truth be told, you just want to know what the heck is going on. You can only handle those goosebumps and spine-tingles before you start devouring the book and flying through the pages to get the answers you are craving! Author, Madeleine Roux definitely did her job by keeping you on the edge of your seat. Not offering anything up easily. She made you work to learn the truth, while spooking you out at the same time! The only criticism I could give this book was it's character deliverance. I wish there was more back story given on Jordan. Because of his lack of introduction and back story, I found it hard to connect with him, and in the end, just found myself irritated by him. However, that was such a minor flaw! My connection(or lack of) with Jordan did not effect my over all feelings of this book. It was a great introduction to the month of Horror! I really enjoyed the creepy pictures throughout and the story was really well thought out, but I actually felt that there needed to be more. The characters made it difficult for me to really get through the book and I felt like I was missing out on the story at times. It was definitely creepy but I think it needed to be fleshed out a little more than it was. I like the incorporation of pictures in a book, makes it sound even scarier! :D Great review. The actual personas made it tough for me to essentially get through the actual guide as well as My partner and i sensed like My partner and i ended up being passing up on the actual history from time to time. I liked this book a lot too though I agree there could have been more done with the characterization. But the plot itself was pretty exhilarating!